Activism has never been cooler than it is in 2019. Well, maybe that’s not entirely true, but political engagement is at an all-time high among nearly all audiences, especially young people, who are turning out to vote in historically high proportions worldwide. As stars like Beyoncé, Lady Gaga, Taylor Swift and Katy Perry wade into the political fray, young people respond by registering to vote, donating money, attending protest rallies & more. Far from slacktivism, when Ariana Grande has a voting registration booth at her concert or Rihanna wears a Hillary Clinton shirt days before the 2016 election, it makes politics trendy. Suddenly it’s cool for fans to vote or carry a tote bag with their favourite candidate’s slogan on it or just to be open about who they’re voting for. Where Baby Boomers and their parents (the aptly-named Silent Generation) were raised with the attitude that it’s inherently rude to discuss money, religion or politics, their Millennial children and grandchildren care more than any other generation today about the values of those with whom they associate. From their workplaces to their friends to the products they choose to purchase, Millennials want to support people and brands that stand for something. It’s not a stretch, then, to see that a generation who places such a premium on values would also want to broadcast their own values clearly to those around them. This brings us to today’s political races. The US 2020 presidential primary got off to a running start earlier this year, with ‘an embarrassment of riches’ throwing their hats in the ring. And while only the very oldest Millennials are eligible to run for president, this will be the first presidential election where all millennials are old enough to vote. Indeed, this fact alone has candidates appealing to Millennials and their unique set of values more than in past election cycles. In lieu of the semi-anonymous bumper sticker on the back of the car of their parents’ generation, today’s politically-active young people want to show the world who they’re voting for… and they want to engage with people who agree (and disagree!) with them. Politicians are listening: far from the bland, always red or navy blue, logo-only stickers and signs of the early 2000s, promotional merchandise today is stylish, engaging and fun. 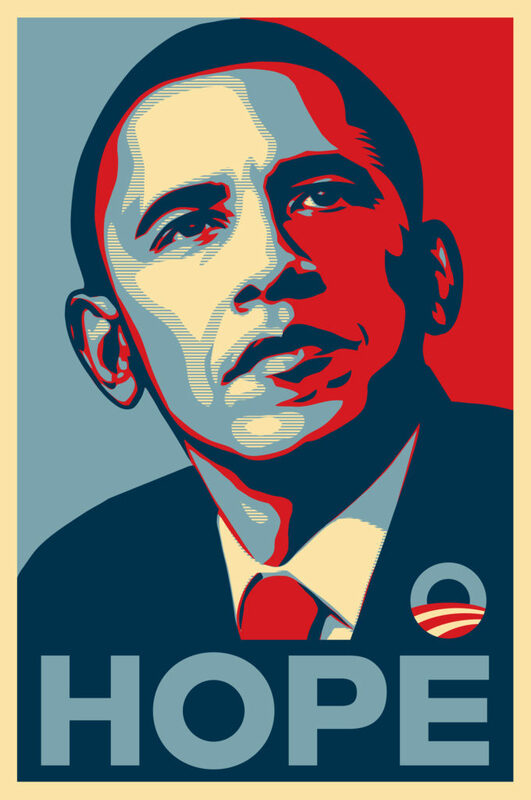 Thanks in part to Obama’s historic 2008 run for office (which came at a time when exactly half of Millennials—those born from 1980-1990—could vote) and legendary street artist Shepard Fairey’s viral unofficial campaign poster, suddenly political branding had cultural cachet. Fast forward to the 2016 campaign and the differences between the candidates were easy to see in their merchandise alone, Trump’s slapdash red hat contrasting sharply with Clinton’s polished, design-forward aesthetic with inspirational, clever slogans. Kamala Harris has a smart slogan based on the way she introduced herself in court when she worked as a district attorney: Kamala Harris, For the People. She further differentiates herself with a unique colour scheme—none of the played-out red, white & blue for Harris, she instead has chosen a yellow, purple and orange theme that will definitely stick out come debate season. 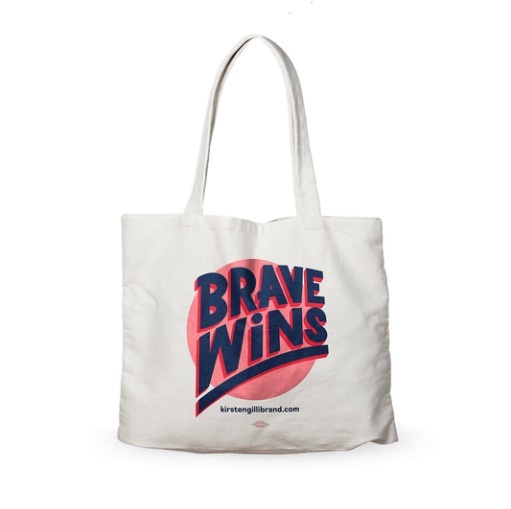 Kirsten Gillibrand has also set herself apart from the competition with an unabashedly feminine bright coral logo and a webstore that contains babygrows and the strong tagline ‘Brave Wins,’ a particularly apt slogan for a female candidate in this era. Perhaps the candidate with the most design savvy in her choice of merchandise, though, is Elizabeth Warren. From dog collars reading ‘Consumer Watchdog’ and aprons with clever quotes to the standard t-shirts, shoppers and stickers, Warren makes up for the standard red-white-and-blue colour scheme with a variety of products and styles. 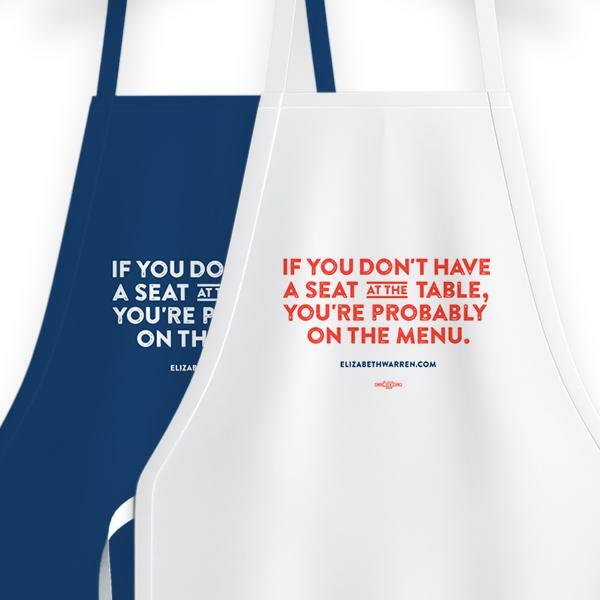 Plus, rather than relying on a single tagline, Warren’s shop contains items with quotes from her, quotes about her, and clever slogans like ‘The Best President Money Can’t Buy,’ a theme that has already threaded its way through all aspects of her campaign. 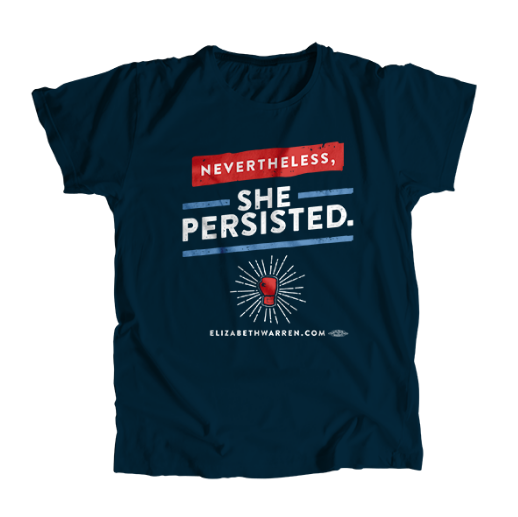 Best of all, though, is Warren’s willingness to subvert expectations by using the ‘Persist’ tagline that inadvertently became tied to her after she was scolded by a senior Senator from the Republican party. When Mitch McConnell silenced her speech in the Senate and then explained his decision with the line ‘She was warned. She was given an explanation. Nevertheless, she persisted,’ he intended it as a reprimand. Warren turned it into a rallying cry, and her decision to bring it back out as a slogan of her campaign two years after it debuted is a great way to remind people that she’s been on the scene fighting for her constituents for awhile now. We’ve still got more than a year to go before we have a Democratic nominee for president in the US, but in the meantime, we’re excited to see how the candidates will reach all of their audiences—no matter their age.